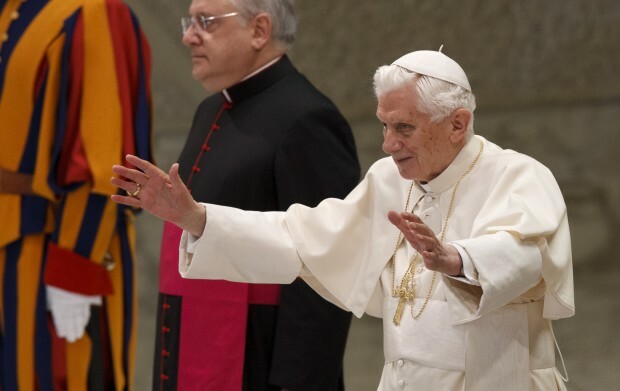 VATICAN CITY (CNS) — In a world of hardened hearts and titillating distractions, Christians need to keep the Gospel message simple and live what they teach with love and joy, Pope Benedict XVI said. During his weekly general audience Nov. 28, the pope spoke about the challenge of communicating the saving truth of Jesus to today’s men and women whose hearts are “often closed” and whose minds are “sometimes distracted by the glitz and glam” of the material world. The first condition to establish is that people can legitimately talk about God because God himself speaks to humanity, the pope said. “The first condition for talking about God is, therefore, listening to what God himself has said to us,” he said. “God is not a distant hypothesis about the origin of the world” and he isn’t an abstract form of “mathematical intelligence,” rather he is real and “is concerned about us and loves us,” the pope said. In Jesus, people can see the face of God, who descended from heaven to be with humanity, “to teach us the art of living, the road to happiness, to liberate us from sin and make us children of God,” he said. Another essential condition for communicating the faith is to put Christ on center stage, not oneself, he said. When St. Paul, for example, shared the faith, he didn’t espouse a philosophy he developed or ideas he dreamed up, but rather stuck to the real presence of God in his life. The apostle “didn’t talk about himself; he didn’t want to create a fan club or lead some school of thought,” but wanted to lead people directly to Christ, the pope said. This is the style individual Christians and their communities are called to follow: “to show the transformative action of the grace of God, overcoming individualism, narrowness, egoism and indifference, and living God’s love in daily interactions,” he said. Christians need to look at how Christ communicated. He spoke about God and his kingdom showing “complete compassion for the distress and difficulties of human existence,” the pope said. It demonstrates credibility and “that what we say is not just words, but reflects reality,” the pope said. That way Christians can “communicate, without fear, the answers that faith in God offers” to people’s needs and today’s challenges. One of the best places to start talking about God is in the family — “the first school for communicating the faith to new generations,” he said. Parents need to help their children become aware of God’s love, talk about the Christian faith, foster a critical eye toward the many influences children are exposed to and be prepared to answer children’s questions about God and religion, the pope said. But above all, he said, communicating the faith must always be done with joy — a joy that doesn’t ignore or hide from the pain, difficulties and conflicts of the world, but knows how to respond to them with Christian hope. “It’s important to help all family members understand that faith is not a burden, but a source of deep joy,” he said.